Villa Rufolo is a place of inestimable beauty. The beautiful gardens of the villa offer a unique panorama of the Amalfi coast and Gulf of Salerno, and at Villa Rufolo is precisely where the concert at dawn will be held, in Ravello, on the night between August 10th and 11th, 2011. The FVG Mitteleuropa Orchestra, assisted by Giovanni Punzi on clarinet, will perform on this occasion, giving way to a passion for classical music, but also to new listeners who are approaching these sounds, to live a day of maximum musical expression. The program is divided into two, a first part, on Wednesday August 10th, which will see the orchestra perform at 19.45 pm at the main event, also later performed on Thursday, August 11th, at 05.00 in the morning. The first event will cost 15 euros, the second 60. Description: Villa Rufolo is a place of inestimable beauty. 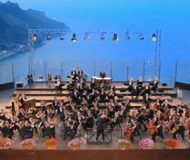 The beautiful gardens of the villa offer a unique panorama of the Amalfi coast and Gulf of Salerno, and at Villa Rufolo is precisely where the concert at dawn will be held, in Ravello, on the night between August 10th and 11th, 2011.